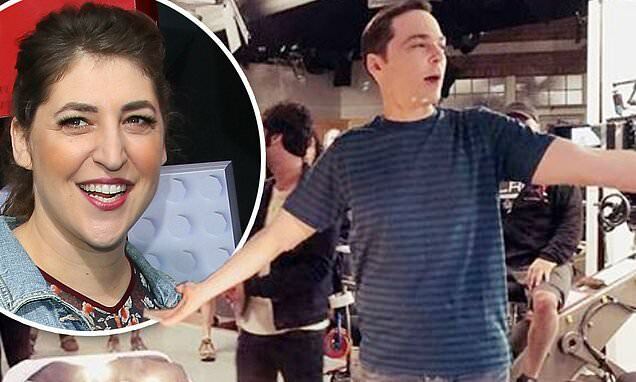 As the final season of The Big Bang Theory is winding down, actress Mayim Bialik is sending some birthday love to her co-star Jim Parsons. Though his birthday isn't for a few more days (March 24), Bialik, 43, got a head start on wishing Parsons a happy 46th birthday on Wednesday. Bialik also shared a few candid photos of Parsons on the set, standing over a birthday cake while crew members applauded. 'Happy birthday for the last time working with the man I was told to imitate for an audition 10 years ago which changed my life,' Bialik began. 'Jim you are so much fun to work with and be friends with. Your success inspires me so much as does your heart the size of Texas,' the actress added. Bialik has played the love interest of Parsons' character Sheldon Cooper for 10 years, first appearing on the Season 3 finale in 2010. While none of the other cast members have chimed in with birthday wishes of their own, Parsons won't turn 46 until Sunday. CBS announced last week that The Big Bang Theory one-hour series finale will air Thursday, May 16.